It’s been one working week since Alberta Premier Rachel Notley announced her decision to force curtailments on the province’s oil producers, triggering a wave of reaction from industry players and analysts that ranged from applause to apprehension. - Alex Pourbaix, CEO of Cenovus Energy Inc.
Cenovus CEO Alex Pourbaix joins BNN Bloomberg with his take on Alberta Premier Rachel Notley's decision to cut crude production in the province and what it means for the oil patch. - Gwyn Morgan, founder and former CEO of Encana Corp.
Gwyn Morgan, founder and former CEO of Encana, calls Alberta's oil output cuts a "no-brainer" and tells BNN Bloomberg he's surprised it took this long for the Alberta government to implement this measure. He said comments to the contrary are coming from those with vested interest. Alberta Premier, Rachel Notley is urging producers to curb their production in an effort to boost the ailing energy sector. Rona Ambrose, NAFTA Advisory Council member and global fellow of the Woodrow Wilson Canada Institute, tells BNN Bloomberg that there are only "winners and neutrals" with this move. - Hal Kvisle, Chairman of ARC Resources Ltd. and former CEO of TransCanada Corp.
Hal Kvisle, chairman of ARC Resources and former CEO of TransCanada, says while he has sympathy for Husky and Imperial Oil and that the oil crisis in Canada is an "extraordinary situation" that required action. He also says Canada's regulatory process continues to be a key issue for the industry and that Bill C-69 is going to "make things worse." - Derek Evans, CEO of MEG Energy Corp.
MEG Energy CEO Derek Evans discusses his support for Alberta's plan to curtail some oil output in the province, as well as the latest on Husky Energy's hostile takeover bid for the company. 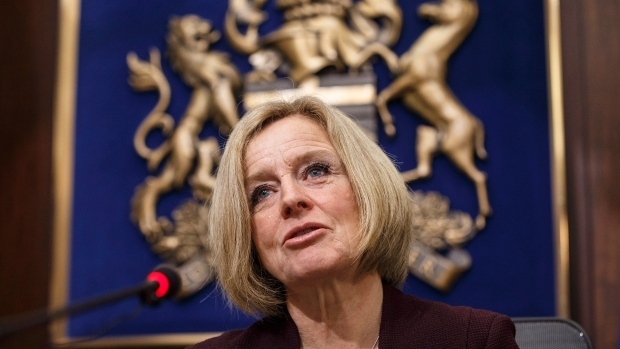 Premier Notley's plan to cut oil production comes with mixed views. Goldy Hyder, CEO of the Business Council of Canada, says business leaders are on different sides of this in terms of what their interests are. He also notes that it is quite telling for desperate measures such as these to have become necessary. “Companies have to do what’s in the interest of their shareholders and the survival of their companies, and producing oil when you’re getting paid US$14 and US$15 a barrel isn’t prudent… Does it have an impact on the economy? Of course it does. And that’s why the country as a whole has to realize: this is not Alberta’s problem, it’s not Saskatchewan’s problem. This is Canada's problem." - Frank McKenna, deputy chairman at TD Bank and board member at Canadian Natural Resources Ltd. Ahead of the premiers' first ministers meeting this Friday, Alberta Premier Rachel Notley and Saskatchewan Premier Scott Moe have sent a letter to Justin Trudeau urging him to put oil on the agenda. Frank McKenna, deputy chairman at TD Bank and board member at Canadian Natural Resources, tells BNN Bloomberg the energy sector woes are "not Alberta’s problem, it’s not Saskatchewan’s problem – this is Canada's problem." Jason Kenney, Leader of Alberta's United Conservative Party discusses why the federal government should be doing more to help Alberta through its current crisis. Rafi Tahmazian, senior portfolio manager with Canoe Financial, shares his recommendations with BNN Bloomberg on how to get out of current energy crisis. From pipelines to the carbon tax, Catherine McKenna, environment and climate change minister, talks to BNN Bloomberg ahead of the first ministers' meeting about the pressures Ottawa is facing amid the energy crisis.